On Tuesday, the Washington Post featured a profile on Democratic New York State Senator Kirsten Gillibrand, who is taking time out of her reelection bid (she's expected to win by a 2 to 1 margin, so it's nbd) to personally ensure that, after the next election cycle, she can look forward to seeing more women waiting patiently in the Capitol Hill cafeteria line for tater-tots. There are are currently just 17 women serving in the Senate, and a mere 75 in the House of Representatives, glaring minorities that do not sit well with Gillibrand. If both the House and Senate were more evenly proportioned, she recently told a donor conference, "We would not be debating contraception. We would be debating the economy, small business, jobs, national security - everything but." 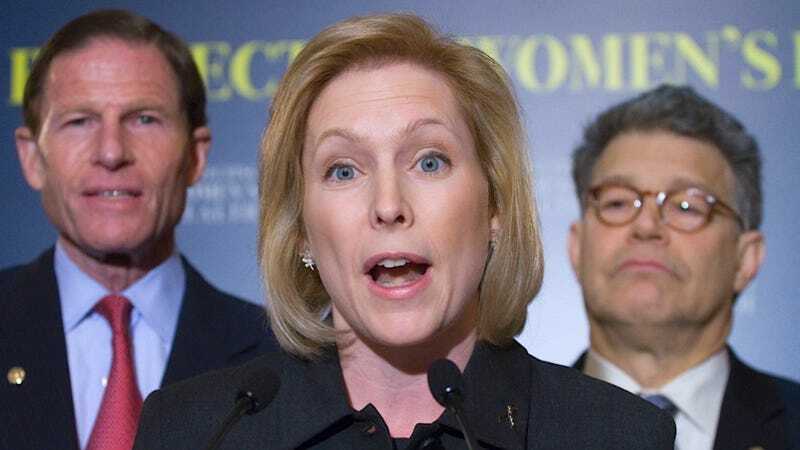 Gillibrand has been helping to raise money for three different prospective female candidates, each of which would face a GOP incumbent. Former Iowa first lady Christie Vilsack will challenge Rep. Steve King (R.) in Iowa; Iraq veteran Tammy Duckworth will face Rep Joe Walsh (R.) in Illinois for control of the Chicago suburbs district; and former Orlando police chief Val Dennings will seek to unseat Rep. Daniel Webster from his unexpurgated dictionary throne. The Monday fundraiser cobbled together over $100,000 for all three women and, despite prevailing Republican sentiment in all three contended districts, the challengers seem to be keeping pace with the incumbents, an underdog narrative, notes the WaPo, that should be familiar to Gillibrand considering she originally defeated a Republican incumbent from a conservative House district in New York State. Now, however, Gillibrand is quickly becoming a prominent face in the Democratic party, having notched the third-largest fundraising total ($14 million) in the whole party. Her opponent, Wendy Long, has raised a mere $113,000 by comparison. I want to make it a call to action - asking women first and foremost to vote; second, being an advocate on the issues they care about; third, holding their lawmakers accountable on their priorities; and then hoping to get a few more to run. Most men - I don't want to say that - many men will say, ‘Of course I can do it.' It's the first thing out of their mouths. But a woman will always doubt herself," she said. "It's more in our nature to be questioning. Can this be done? Will I make a difference? That's one of the things you have to address up front - yes, you can do it. Hopefully, Gillibrand's profile continues to rise so that her work with Off the Sidelines garners more attention and helps make our representative government a little more, um, representative of the population it...represents. Dammit.